Driving approximately 20 km south of Wetaskiwin on Highway 2A the green highway sign will indicate you are entering the community of Maskwacis. The community is comprised of 6097 residents living on the Samson reserve and 1685 off-reserve; 3334 in Ermineskin and 950 off reserve; 1714 in Louis Bull and 395 off-reserve and 746 in Montana and 217 off reserve. Many of the 11,891 aboriginal neighbours living on the reserves, their relatives or their friends seek access to health services in Wetaskiwin. http://www.aboriginal.alberta.ca/InteractiveMap.cfm. 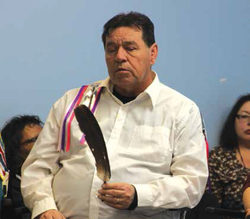 On February 5th, 2015 representatives and voices from both worlds came together in the Wetaskiwin Hospital and Care Centre to participate in a ceremony including a traditional Aboriginal pipe ceremony to officially open the newly dedicated Aboriginal Cultural room in the Wetaskiwin Hospital. The room will provide a place of spiritual healing for Aboriginal patients and their families. Planning for the space began in the summer of 2014 following collaborative efforts between the Hospital, the Aboriginal Health Program’s Central Zone team and the federally funded Maskwacis Health Services. Tracy Lee, Aboriginal Health Lead with the Alberta Health Services’ Aboriginal Program in AHS Central Zone understands the need for such a space. “Aboriginal populations believe health is holistic and comprised of emotional, mental, physical and spiritual wellbeing. Aboriginal families are large and cultural adoptions between families can make the family even larger. This room will allow those families to provide support in a culturally meaningful way. All the representatives and guests at the official opening ceremony were united about the importance of having the Cultural Room in the Hospital. The room is strategically located in a quiet zone of the Hospital. It is tastefully decorated with Aboriginal artwork and comfortable furniture that provides an appropriate setting where patients and their families can partake in traditional ceremony and prayer. The room will be accessible 24 hours a day through nursing staff as well as through Aboriginal Health coordinator, Claudette Yellowbird. Patients in the Wetaskiwin Hospital now have a space where they can smudge (the traditional practice of burning dried herbs) and to pray in private with their families and friends. As the smoke rises, it becomes the messenger, carrying our prayer words and thoughts to the Spirit World, where the prayers will be heard and processed by the Grandfather Spirits to our Creator. The connection (joining) is to try and create a balance between human activities and natural element process. The purpose of the smudge is to take away or lift any negativity that might interrupt the praying process. A participant should remain focused and concentrate so the negative energy form the hands, mouth, eyes, ears and body are lifted away. The aroma of the burning medicines stimulates our brain to produce a natural healing process to the mind, body, spirit and emotions. When the smudging ceremony is over, your expectations are to be protected from any negativity and a sense of wellbeing. The Cree Elders say, ‘the understanding and significance is that the pipe is the messenger that opens the connection with the spirit world’. The pipe must be treated and handled with great humility and great respect because it symbolizes the unity, peace and harmony. The pipe ceremony is a sacred ritual to seek blessings upon a selected place or activity. The pipe ceremony is a link between the earth and sky and a reminder that the bond between the humans and elements (fire, water, air and earth) is not broken. The pipe is kept in a sacred bundle that is owned by the pipe carrier who is usually a person who is worthy, has knowledge of ceremonies, conducts prayer lodges, and is recognized by the spirit world. The ‘pipeman’ (Ospwakannewiniw) is allowed to open the bundle to prepare for the ceremony. The pipe ceremony participants must place a high value on modesty to understand and respect the traditions/customs of the pipe carrier. The natives had themselves always practiced a traditional medicine, which the white settlers would avail themselves of in times of need. Native and white women alike acted as midwives, learning their trade from experienced midwives or by necessity. The first white child in the Wetaskiwin area, Frances, the daughter of Frank and Margaret Lucas, was delivered with assistance of a native midwife in February, 1885. Skilled native women helped ensure the safe delivery of many of the newborns until homesteaders’ wives developed the necessary skills. In 1894, Wetaskiwin had is first recognized medical professional, Dr. Edward Sharpe, a graduate of McGill Medical School. Pictured: The feather was passed around the circle with each of the participants offering comments. Photo by Barry McDonald. See more photos from the event in this week’s paper.